The Education Studies and Global Studies Departments at The New School presents a discussion by Cambodian-American photographer Pete Pin. In the fall of 2010, Pin set up a makeshift portrait studio in his grandmother's garage in Stockton, California and, right before he took her photo, she recounted for the first time in her life the heartbreaking details of his family's experience during the Killing Fields. As she spoke, Pin was overcome with a sense of history and a connection to a past that had for so long been withheld from him. Building on this, over the last several years he has engaged in a series of conversations with Cambodian-Americans while photographing Cambodian communities across the country. 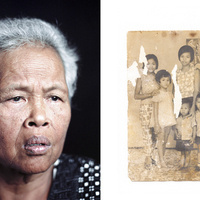 The Cambodian people are among the most heavily traumatized people in modern memory. They are the human aftermath of a cultural, political, and economic revolution by the Khmer Rouge that killed an estimated two million, nearly a third of the entire population, within a span of four years from 1975-1979. Born in 1982, in the refugee camp to which his family had fled following the Cambodian genocide, Pin seeks to use photography as a means to bridge this chasm. Working in Cambodian communities across the country, his project explores the complexity of the Cambodian American experience as well as the rebuilding of an identity fractured across time and space. It is his generation, the direct descendants of the genocide who, through their proximity to history, shoulder the greatest responsibility in telling this story.